The chess board setup is very easy. Many people, mostly home players, don't know how to place the chess pieces correctly. Just remember the two rules outlined here. 1) The right corner square must be a white square. Before you put any pieces on your board turn it around so that you see a white square at the right lower corner of your chess board. 2) Place white queen on white square and black queen on black square. Put the queen always on its own color. If you want to play the black pieces then put your black queen on the black square beside your king. If you want to play the white pieces put your white queen on the white square beside your king. It doesn't matter if you have the black pieces or white pieces in front of you. You will see that the numbers are correct when you follow the rules above. That means the number 1 starts at the white side of the board and the number 8 ends at the black side of the board. When you have White the letter a starts always at the left and when you have Black the a starts at the right hand side. 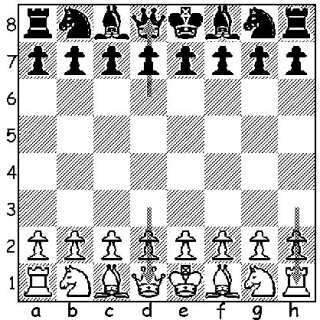 Look at the chess image below and you will see how the queens are placed and that there is a white square on your right side where your rook is located. No matter if you have Black or White. When you turn the board around and have the black pieces in front of you, then there is also a white square on your right corner. So the white king is always sitting on e1. And the black king is sitting on e8. The white queen is always placed on the square d1, and the black queen is always sitting on d8. The white pieces are sitting all on the first two rows, namely on row 1 and row 2, and the black pieces are always placed on row 8 and row 7.